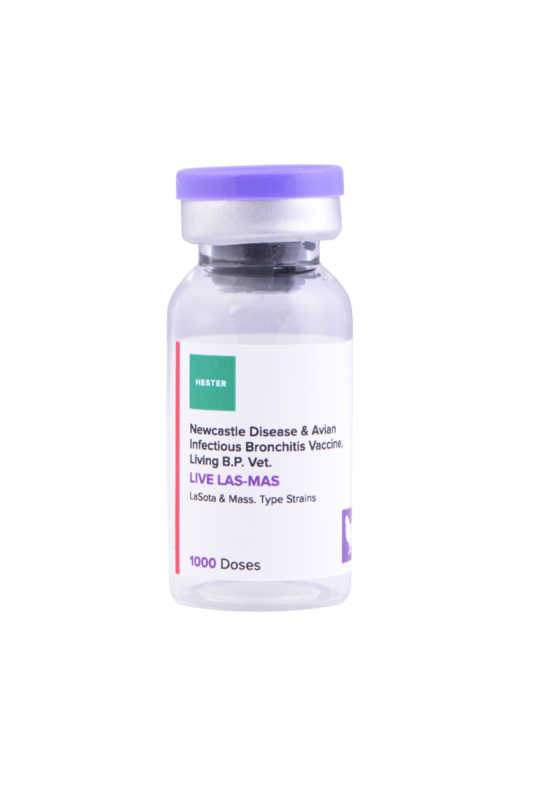 It is recommended for vaccination of chickens against Newcastle Disease and Avian Infectious Bronchitis, for both initial vaccination and revaccination. It is a live, CEO virus vaccine. It has been lyophilized (freeze-dried) in vials and sealed under vacuum to preserve stability. It is supplied with or without diluent. The product meets rigid 'Quality Control' standards of Purity, Safety and Potency as per individual monographs of viral vaccines of B.P. (Vet). Each dose contains not less than 106 EID50 LaSota strain, Newcastle Disease virus and 103.5 EID50 Mass. strain, Infectious Bronchitis virus. This vaccine is recommended for use at 2 weeks of age or older. A second dose should be given 4 to 6 weeks later. For replacement pullets, a booster vaccination should be given between 16 and 18 weeks of age. Drinking water vaccination should be done during the cooler part of the day. Remove any disinfectant or sanitizer from the drinking water for 24 hours, prior to and after vaccination. Rinse all waterers with clean water prior to vaccination. Withhold drinking water for at least one hour prior to vaccination, to allow birds to get thirsty. Mix vaccine in the drinking water according to the schedule mentioned in the pack insert, supplied with the vaccine. Provide ample drinking water space to all the birds. Do not use chlorinated water. Rehydrate the vaccine with the diluent provided. Place the dropper over the vial containing the rehydrated vaccine. Hold the chick with one eye turned up. Put one drop of vaccine into the open eye and hold until bird swallows. Respiratory symptoms will be more pronounced from the first vaccination and will vary with the age and the level of parental immunity in the chicks. While birds are going through the reaction period, keep them comfortable by providing adequate heat and good ventilation. This vaccine is lyophilized and packed 10 vials per box. It is available in 100, 200, 500, 1000, 2000, 2500, 5000 and 10000 doses per vial. It is supplied with or without diluent.